Royal Mail will be temporarily installing Post and Go machines (A003 and A004) at its Enquiry Offices in Crewe and Bradford North from 3 December 2014. The machines will be in situ until the end of January 2015. The machines will carry the Winter Greenery stamps. These machines will be the only source of the Winter Greenery without additional inscriptions from IAR machines. Jersey Post’s JE01 series Post and Go machine will be arriving at Jersey Post Headquarters for the lead up to Christmas. The machine will be temporarily located in the foyer at Rue Des Pres from Monday 1 December until the New Year. The machine will vend stamps featuring Jersey’s first Post and Go design, the Jersey flag, as well as Royal Mail stamps depicting the Union flag. Both stamp designs will carry the unique location identifier ‘Jersey Post HQ’. To celebrate the festive season, and spread some Christmas cheer, the Jersey Post and Go stamps will also feature a special ‘Merry Christmas’ overprint during the month of December. The message will be printed on Jersey stamps available from the JE01 machine at Rue Des Pres and the static JE02 Post and Go machine located at Jersey Post’s Broad Street Post Office. The Union flag stamps in both machines will not carry the overprint but will still feature their respective location identifiers. Jersey Post has plans to widen its Post and Go product range for 2015 with a beautiful new stamp design planned for February and some exciting overprints, the first of which will be available from the JE02 kiosk from the 24 January for one month only. We will not be stocking the stamps from Crewe, Bradford or Jersey. So no P&G at York, unless A005 & the former BPMA A001 are used. Unofficial reports are that there will be no Post and Go machines at UK exhibition venues from 2015 except for Stampex, Perth Scottish Congress and Europhilex. It's possible that the Congress idea may extend to the Philatelic Congress of Great Britain but the administrative burden on the Perth organisers would probably put PCGB organisers off! What's IAR / iAR, Ian? It's new to me. Intelligent AR, the company which provides the software for Exhibition and travelling Post and Go machines > http://www.iarroyalmailpostandgo.com/index.php This website is an unofficial source of information which is only supposed to be there after release is approved by Royal Mail / Jersey Post. Thanks, Ian. So they have different software suppliers for Wincor and NCR machines? That would explain the font and text position variants. So does this mean that the 2nd class Machins from Hytech machines with the smaller typeface introduced during 2014, will not be available without BPMA overprint at York as one would expect from past practice, but they may be available without BPMA at Stampex ? Regards. IAR website indicates that A005 is going to a permanent home in January! Worrying isn't it? I was told about this a couple of weeks ago, but on the basis that there isn't really anything to say, I didn't include it in a main blog post. No doubt it'll be somewhere obscure and inaccessible for the average collector! I think the British Museum would be a good place to put it from a tourist footfall/potential sales point of view but we already have the BPMA machine in London? However perhaps a more northern location might be appropriate. MOSI in Manchester perhaps or IWM North? What really matters is the purpose and reasoning. I'm not convinced - from reports of visitors - that the NMRN is a good idea, or that the staff have any idea why it is there. The sensible thing to do would be to have it in the Tesco’s on New Bridge Street weeks to compensate for the loss of Tudor Street. As the store is open from 6am to midnight 7 days a week, it would provide better access to the sale of stamps in that area of London for tourist, which sees most of the shops shut on Saturdays and Sundays. I think London surely has enough kiosks,bring it up north,how about Scotland?. Are the examples from Crewe with a 2 December date correct (eBay item number: 201238732817 & 151508377924) and the announcement erroneous or was the machine’s setting wrong? 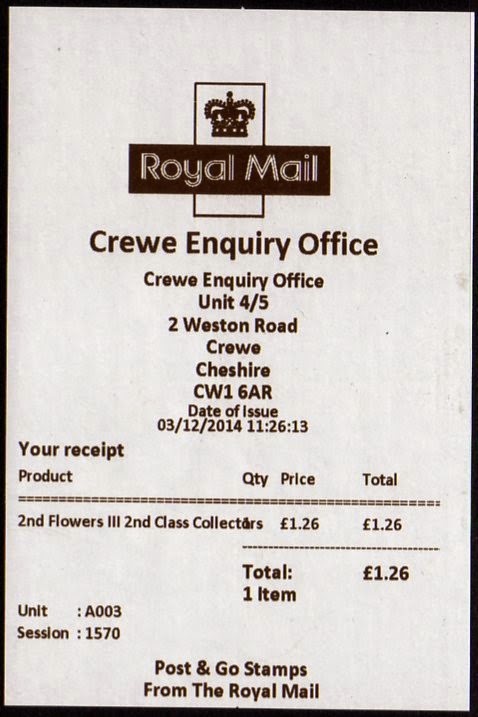 Does anybody know what is being dispensed from Crewe and Bradford since Jan 2015....is it greenery or machins/flags? Visited Bradford on 2-Jan-15 and Winter Greenery was being dispensed - Datastring B1GB15 A004, i.e. First Day of Issue, with new datastring. Stuart.